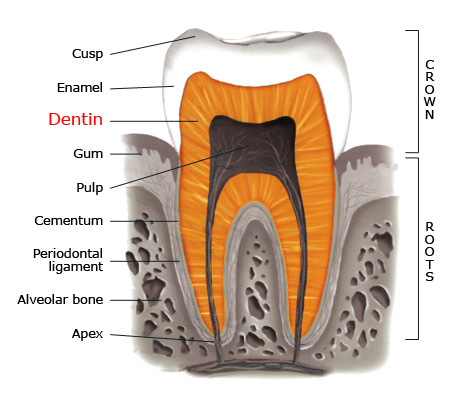 Dentin is a hard and calcified tissue of a tooth that is covered by enamel at the crown level, and by cementum at the root level. Just like dental enamel, dentin is primarily composed of hydroxyapatite (crystalline calcium phosphate), but is overall softer and more brittle, which makes it more vulnerable to tooth decay. Dentin is produced by cells called odontoblasts. The yellow appearance of dentin affects greatly the colour of a tooth due to the enamel’s translucency. If the enamel is eroded or the gums recede to expose the roots of a tooth, the dentin becomes exposed and is very sensitive to pressure, heat, cold, airflow, or foods that are sweet or sour. This condition called dentin hypersensitivity can be either treated with the use of desensitizing toothpaste, the application of fluoride solutions, or dental procedures to cover the exposed surfaces.